Indeed, on that particular day the Executive Committee of StreetNet examined and accepted the application for affiliation of FETTEI-CI which is the first organization of Côte d’Ivoire that has joined the large family of StreetNet. Created in 2013, FETTEI-CI is an urban alliance made up of markets vendors cooperatives, street vendors and hawkers cooperatives, small traders’ association, domestic workers union and washerwomen/men association (home laundry). For the moment, FETTEI-CI operates in two districts in Abidjan and intends to recruit more members in other districts of Abidjan and in some other cities. Its current membership is 3050 members. The office of FETTEI-CI is located in Yopougon district, one of the popular suburbs of Abidjan. A meeting took place on 23 November 2018 at the office of the federation to celebrate this affiliation. All the executive members of the federation attended the meeting chaired by Douai Marceline, Chairwoman of FETTEI-CI. Sibailly Douhour, StreetNet Organiser based in Côte d’Ivoire, seized that opportunity to discuss different issues with FETTEI-CI executive members. The discussion was essentially about StreetNet activities and also the responsibilities of StreetNet and FETTEI-CI concerning their cooperation. FETTEI-CI is member of Dignité, General Confederation of private unions of Côte d’Ivoire, one of the most representative top five workers organisations of Côte d’Ivoire. Dignité is affiliated to the ITUC-Africa. 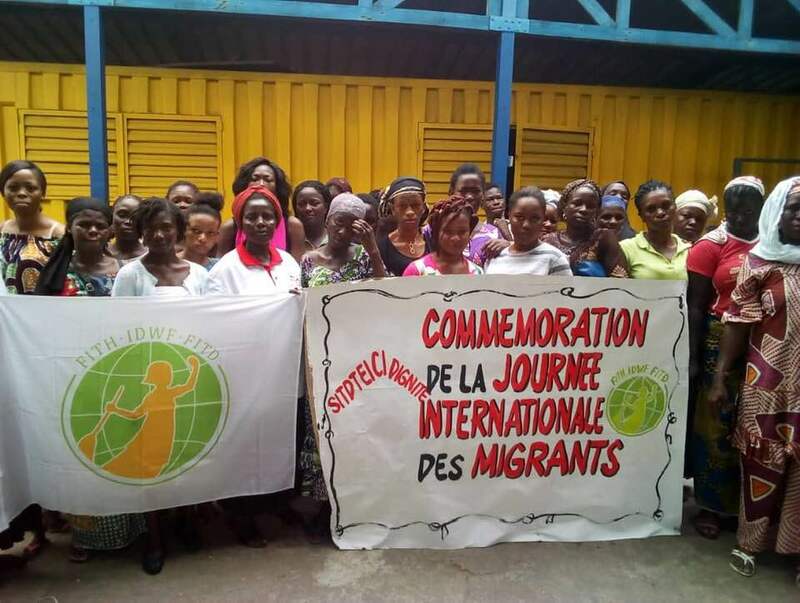 Activities concerning Côte d’Ivoire migration: Sister Douai Marceline, Chairwoman of FETTEI-CI is a member of the group of trade unions platform on the migration on behalf of Dignité. It is a platform which main role is to lead migrant workers to be aware of their rights. It is important to point out that most migrants work in informal economy. StreetNet once again welcomes its new Affiliate FETTEI-CI and wishes them a successful work for the benefit of their members! Previous PostPrevious BUILDING WORKERS’ POWER – CHANGE THE RULES!